Forest Green Rovers have released six players as manager Ady Pennock prepares to rebuild following the club's failure in the Conference play-offs. Goalkeeper Sam Russell, midfielder Kieron Forbes, strikers James Norwood and Stuart Fleetwood and defenders Luke Oliver and Chris Stokes have all left. The players were told after Sunday's 3-0 Conference play-off semi-final aggregate defeat by Bristol Rovers. Rovers had finished fifth in the table, the club's highest-ever placing. 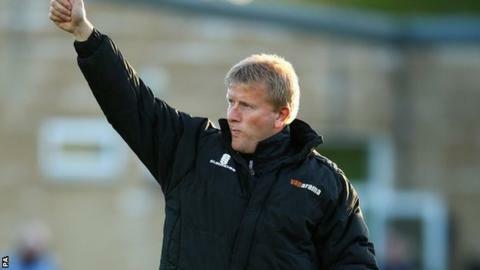 But Pennock is now looking for new faces to try and improve on that. Norwood is perhaps the most notable departure, having scored 50 Conference goals in 170 games for the club since first arriving from Exeter City, initially on loan, in August 2010. Fellow striker Fleetwood was a hit when he first signed from neighbours Hereford United in 2007, finishing as the Conference top scorer with 28 goals to earn a £200,000 move to Charlton Athletic. But, when he returned on loan from Eastleigh in January, he failed to find the net in 18 appearances. Goalkeeper Russell, signed from Darlington in January 2012, played 144 Conference games for the club until losing his place in February to Steve Arnold. Left-back Stokes spent the final two month of this season on loan two levels higher with League One Coventry City, and helping them escape relegation on Sunday. Midfielder Kieron Forbes, who made 107 Conference appearances following his move from Wealdstone in August 2010, finished the season with Sutton United, having spent the first half of the season at Aldershot. Midfielder Luke Oliver, signed from Bradford City in February 2014, had not figured for Rovers since January.